Customer success (CS) is becoming an increasingly important part of the SaaS field. In fact, it’s an important part of business in general. Yes, it’s dangerous to draw conclusions from correlations. But it certainly looks like customer success contributes to growth. And companies are starting to realize that great customer experience set them apart from competitors. If you’re not invested in your customers’ success, you’re going to fall behind other businesses who are. All of that being said, CS is still a rather new field, and it’s not easy to jump into something that you don’t know much about. So we put together this guide to tell you everything you need to know about customer success for SaaS. To put it simply, customer success is the practice of proactively helping your customers meet their goals. Your product exists to help people solve a problem. Customer success is the logical extension of that. You don’t just help your customers by providing a great product—you also provide support, encouragement, and consultative help, too. 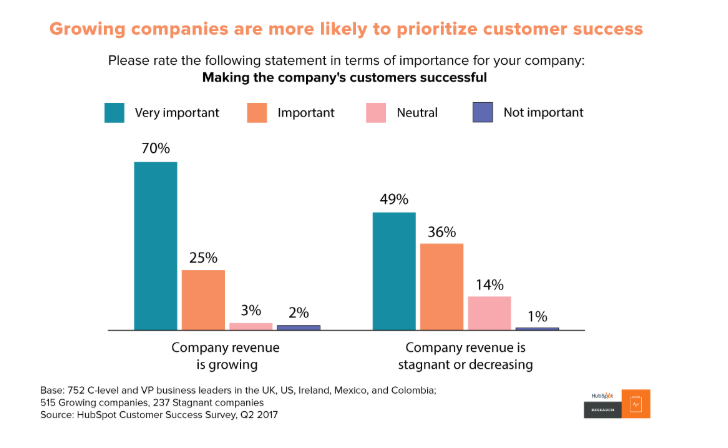 Some companies think of customer success as a type of client or relationship management. Others include it in discussions of customer experience. Some emphasize client value and upselling. But in every case, it’s about making sure that customers succeed. That’s the important part to remember. And it works. HubSpot was able to keep 33% of previously unhappy customers after starting to monitor their customers’ success. And if you know anything about recurring revenue, you know that’s worth a huge amount of money. Keep reading to learn some of the best tactics for making sure your clients succeed! But for now, just know that customer success requires your employees to work closely with your customers to ensure they’re getting the most out of your product. As you continue reading, you’ll get a better idea of what this means on a practical level. What Challenges Do Companies Face Around Customer Success? Implementing a customer success program seems like a no-brainer. But there are some challenges companies face when they get started. And that can make it difficult to get up and running. Let’s take a look at five of those challenges as well as some ways to meet them. The biggest challenge that companies find when they start putting together a customer success program is that it’s not always easy to figure out how customers define success. Not everyone uses your product in the same way. They’re not all in the same industry. They have different goals. You might work with an executive at one company and a manager at another. There’s a huge amount of variation in your customers and their definitions of success. Which brings us to one of the pillars of customer success: building relationships. Your customer success managers (CSMs) build relationships with your customers and develop deep insight into their challenges, goals, and how they use your product. Which is one of the reasons why you hear the word “consultative” thrown around in discussions of customer success. There’s no other way to understand what your customers are looking for. And without knowing what they’re looking for, you can’t help them find it. If your customer success program is working, you can reach out to your customers to help them solve problems—before they reach out to you. Which means you need to know what’s going on at your customers’ companies. And that’s a challenge. In the past, your best bet was to rely on their reports. That leads to a reactive customer support model, and means you can only help your customers when they ask to be helped. Modern tools have changed that. You no longer have to wait until a customer brings up a problem. Customer success software, for example, will show you how many of your customers’ employees have started using your app. You might notice that the adoption rate is lower than expected. So you could reach out and offer help with that. Or you might see that people are using the basic functionality of your app, but not getting the most out of it. You can be proactive in helping those employees learn to better use the tool. This kind of monitoring and customer visibility has completely changed the customer support and success landscape (and has a lot to do with why customer success is associated with SaaS; we’ll talk about that in a moment). Splitting customers up into different groups has been a marketing mainstay for years. But segmentation is a different problem when it comes to customer success. Creating the right segments and communicating with them is crucial for running an efficient customer success program. Especially if you have a small CS team. Targeted outreach is a core tenet of customer success. And proper segmentation makes it easier and more effective. Fortunately, customer success software takes after CRM software. You can enter a lot of information into your database and create detailed segments of your customers. Exactly how you segment them, of course, is another issue. Segmentation for customer success is complicated. But at the very least, you should split customers up into lifecycle stages: implementation, onboarding, training, and so on. In customer support, interactions with clients are (ideally) fast and far between. They call you up, you solve their problem, and they’re on their way. There’s no relationship-building. Changing from that mindset to one where you build lasting relationships can be tough. Again, we come back to the consultative nature of customer success. How can you be active in your customer’s lifecycle? Finding the right answer for your customer base isn’t easy. Every company’s customers go through a unique lifecycle. Figuring out how to build relationships that last and are useful throughout that lifecycle is a challenge. There’s no quick fix for this one. The right tools and training certainly help. But in the end it comes down to knowing your customers and what they need. Why Is Customer Success Associated With SaaS? Today, companies of all types have customer success programs. But customer success is rooted in SaaS. One of the reasons is that the SaaS business model requires continued customer satisfaction for profit. In the past, software companies (like many non-tech companies today) could sell a product and make a profit. After that, there was little need to be in touch with the customer unless they had a problem. Today, however, companies need to keep customers to make a profit. Instead of selling a piece of software for thousands or tens of thousands of dollars, you might sell a subscription to the app for a couple hundred bucks a month. Which means your customer needs to be getting value out of the software consistently over time. That’s where customer success comes in. It’s not all about profit, though. SaaS companies are also uniquely positioned to monitor their products’ usage at all times. If someone buys a batch of steel pipe from your company, you won’t know the exact moment when they install it or if they’re having problems with it. SaaS companies have deep insights into how their products are being used and when an issue comes up. Which puts them at the forefront of proactive customer success. Now, other companies are finding ways to get insight into their products’ usage and their customers’ actions. But SaaS is still the driving force behind customer success and innovation in the field. How Is Customer Success Different from Customer Experience or Customer Support? There’s a misconception that customer success is just another name for customer support or account management. But it’s important to realize that the two are different. The biggest difference between customer success and customer support is that CS is proactive and support is reactive. You won’t find customer support reps calling customers they’ve been assigned to see how things are going. CSMs, however, will do that on a regular basis. They anticipate problems and use customer success software to monitor for issues. Again, it’s a more consultative relationship. You’ll get different answers when you ask people about the difference between customer success and customer experience. Some say CS is part of CX. Others will say the opposite, that CX is part of CS. The two can often be tightly integrated, as the customer success relationship does affect the overall experience. Different CX groups will have different domains and practices. Some might be very similar to customer success. Others might be more different. For example, a customer experience group might work on web design or retail space design, where a customer success manager is unlikely to. And customer experience might include interactions with customer support which, as we’ve mentioned, is very different from CS. Account management is another field that shares some facets with customer success. Account managers are usually focused on cross-selling and upselling. CSMs might be involved in that, but the relationship is deeper. CS teams will have more contact throughout the customer lifecycle than account managers. In the end, all of these groups need to work together (and part of customer success is putting customers in contact with other teams that can help them when necessary). So drawing lines between them is counter-productive. Do I Need to Hire a Customer Success Team? Lots of companies are building customer success teams from the ground up. They might have a VP of customer success, several customer success managers, and technical or marketing staff to support them. Fortunately, you can get started with less than that. If you have two or three people that can dedicate some of their time each week to customer success, that will be a great start to your program. Automating as much of the process as possible will also help. Your marketing team can help automate email outreach. Your engineering team can help set up a chatbot. Your sales reps can be trained in some proactive outreach and follow-up techniques. Having a fully scaled customer success team isn’t the important part of CS. What’s crucial is a commitment to helping customers succeed. It starts at the top of an organization and permeates down to the bottom. That’s what really matters. Not the size of your team. That being said, you do need someone committed to CS. It’s best if they’re full-time, because it can be a lot of work, especially in the beginning. Having the right tools makes the process easier (we’ll talk about those tools in a moment). It’s also important to remember that you don’t need to have a full-fledged CS program right from the start. You can start with a few tactics from the list below and build up from there. What Are Some Common Customer Success Tactics? Okay, we’ve covered the background of customer success. Now we come to the meat of it. What do you do when you do customer success? The answer varies between companies and customer segments. What you do might be vastly different from what your closest competitors do. And what you do for new clients might differ from what you do for repeat customers. That being said, there are some customer success tactics that you’ll see often. Here are five of them to get you thinking about how you can start CS in your own business. This is the signature tactic of customer success. As I mentioned earlier, customer support is reactive, while customer success is proactive. It might seem like a small distinction, but it makes a world of difference to your customer. But what is proactive outreach? What does it look like? In its simplest form, it’s a customer success manager sending an email to a client asking how things are going and if they can help. Sometimes this approach will get you the information you need to take action. Customer success software gives you the tools you need to make that proactive outreach even more effective. For example, you might see that only 60% of your client’s employees have downloaded your app when you expected at least 80%. You can reach out to your client and ask if you can help with the onboarding process. Or you might see that your customer isn’t using your software as much as you thought they might. This can be a warning sign for churn. That means it’s time to get in contact and ask why they haven’t been using your product. And, of course, how you can help. You can share useful content, too—when you publish a blog post that a customer will find useful, let them know with a personal email so they can check it out. Give them a heads-up when you’re going to be at a conference so they can stop by for a chat. Tell them when new features are coming out to get them excited. All of these strategies work for proactive outreach. You and your product will stay top-of-mind, and you’ll get the chance to address issues before they cause churn. It’s a win for everyone. That all sounds like a lot of work. And it can be. Marketing automation is a huge topic in the marketing world right now—but its uses expand beyond targeted marketing. Automating your emails saves you a huge amount of time and effort. All while engaging your customers. The possibilities are almost endless. And with advanced email marketing software, you can set up very detailed triggers that start these campaigns. For example, your welcome series might start on signup, and your training series might start on download. With powerful customer success and email marketing apps, you can do just about anything. So what’s the benefit of all of these emails? Staying in close contact with your customers. That’s a core part of customer success. And while few people are gathering data on how automation affects customer success, marketers say that it’s one of the most effective tools for reaching potential customers. When you first hear about customer success journey mapping, it doesn’t seem like it will be a game-changer. All it does is display the steps of the customer lifecycle in a flowchart. You already know how your customer lifecycle goes, right? The important part of the journey map is that the teams within your company are identified for each step of the journey. So everyone knows whose responsibility it is to keep the customer moving through the lifecycle. Even more importantly, the customer journey map shows how the customer should be handed off from one group to another. Does your sales team add an entry to your implementation database? Do your customer success managers create a ticket in your support system, or do they work directly with your support team? This is one of the central ideas of customer success. Having a customer journey map not only prepared, but visible to employees, is a great way to make sure your customer is set up for success. It’s not just for training new employees. It’s for reminding everyone how to support the customer journey through every interaction. While content marketing sits firmly in the world of marketing, and not usually customer success, you can use the same principles to provide value to your customers. For example, if you find that many customers are dealing with similar issues, you can create a downloadable checklist that helps them solve the problem. Or you can address specific issues in your blog posts. Instead of creating content that emphasizes the value of your product to potential customers, create content that helps current customers get the most out of your product. Maybe it’s an ebook telling people how to solve a common problem. Or an infographic that outlines ideas related to your industry. In short, follow the best practices of content marketing. But don’t just target potential customers. Think about your current customers and their needs, too. This is so important that I’m going to give it its own heading. No list of customer success tactics is complete, because no two audiences are alike. Your customers have unique needs. They have unique definitions of success. Their lifecycle journey is different. So customer success needs to be flexible. You’ll need to adapt to the needs of your customers. Maybe they don’t respond well to email, so you’ll need to make your proactive outreach phone-based. Or handoffs make them nervous, so your customer success agents play a stronger role in implementation and support. Whatever your customers need for success, you’ll deliver on it. Keep an open mind and you’ll find the right tactics for your company. What Tools Do I Need for Customer Success? The most basic customer success tools are an email account and a phone. If you have those, you can run a CS program. That’s all you need for proactive outreach. There are other tools that you’re probably already using that you can use for customer success, too. For example, you can use Google Analytics to see which of your support pages are visited most often. Then you can integrate that information into your onboarding. You can see which of your blog posts are the most popular and make sure that your customers get the maximum value out of them. You can create a customer success journey map in Microsoft Word and send it to your company. Of course, there are plenty more advanced tools that are built for CS. Customer success software gives you a detailed look into the health of each of your customers so you can deal with their issues before they cause problems. You can see how much value you’re providing to customers. See how likely they are to churn. Determine who’s most likely to go from a free trial to a paying customer and focus your efforts. All of these things will help your CSMs do their jobs better. There are many other tools you may want to use when setting up your customer success program. Detailed analytics from Google Analytics or Microsoft Power BI show you what your potential customers are interested in. Email marketing software lets you automate your outreach and see where you’re providing the most value. Social listening and scheduling apps make it easier to provide value to your customers on social media. Chatbots help customers find the information they need as quickly as possible. Again, you’ll find what works best for your customers. You may use one of these tools. You may use them all. You may use something completely different. Whatever works for your customers is the best tool. How Do I Measure Customer Success? There are many different ways to measure customer success. But one stands out above them all: churn. There are several different kinds of churn that you can measure, but they all come down to the same thing: how many customers do you lose on a monthly (or yearly) basis? In effect, it’s a measure of how happy your customers are. If they can’t live with your software, your churn rate will be very low. If there are other options out there that are better, cheaper, or easier to use, it’ll be higher. As a SaaS business, you’re probably monitoring a lot of these things already. If you’re not, it’s time to start. How Can I Get Started With Customer Success? As you can see, customer success can be complicated. But you can start with one simple change in your company. All you need is a customer-focused mindset. Like they say at Oracle, “Our customers’ success is our success.” If you adopt that mantra, you’ll be well on your way to a great customer success program. You don’t have to hire a whole new team or buy expensive new tools (though both will help a lot). All you need to do is get your team on board with a customer-centric viewpoint. Obviously you’ll also need to adopt some of the tactics above. But that’s the easy part. The most important thing to focus on is making sure everyone at your company understands the value of customer success. Once you’ve done that, you can start having your account managers or support techs begin proactive outreach. Your executives and team leaders can create a customer journey map. Your marketers can develop content specific to current customers. But all of that is built on the right mindset. So how do you actually do that? Have a candid conversation with your employees. Tell them that modern companies no longer succeed by providing a great product. They succeed by selling success and forming close, consultative relationships with customers. Compared to fields like sales or marketing, customer success is still very new. Which means we’re still trying to figure out exactly what it is. How does it fit in with other teams? Is it part of marketing? Maybe a type of account-based marketing? Does it include customer experience, or is it a sub-type of CX? How should CS teams fit into your business? Should you outsource customer success? We don’t have the answers to those questions yet. And that’s one of the things that makes customer success so exciting. Not only do you get to help your customers solve their most important problems, but you get to help define an entire field of business, too. If you want to join us on our own journey in defining customer success, sign up for our newsletter! We’ll send you blog updates with ideas on how to improve your CS process, thoughts on the field in general, and more ultimate guides.